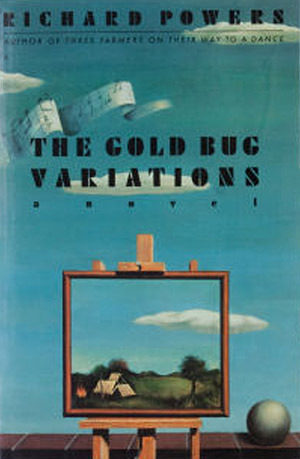 The Gold Bug Variations, Richard Powers, HarperPerennial, 1991, ISBN 0-06-097500-8, $13.00, 639pp. This book was at the top of my AlexLit recommendation list, and I have to admit that Hypatia hit a home run with this book. It took me a long time to finish, mostly due to never being able to give it all of my attention, instead having to catch a chapter here and there when I could amongst all the moving plans, preparations, and actual occurrence. While reading it, I could not help myself from remarking to several people how it was the best science fiction book I had read in 10 years. The book is two stories: the first is that of Jan O’Deigh, a reference librarian at a branch in New York City who finds herself caught up by Franklin Todd in discovering just who is this mysterious Dr. Stuart Ressler, whom Todd works with on the graveyard shift for a computer processing firm. The other story is that of Stuart Ressler, a young PhD who sets out in 1957 to crack the genetic code and falls in love with a member of his research team. The two stories are quickly revealed as love stories–but not just sexual love between the two couples, but an extended love of discovery, of knowledge, and of friendship. “Science Fiction?” you ask. This sounds like one of those mainstream literature books that’s all about adultery and real life. It all depends on how you define science fiction. I’ve been accused by Jill that I’m the worst hypocrite when it comes to defining science fiction by limited it to what I like. For example, I despise David Brin’s The Postman so much that I refuse to call it science fiction. To me, The Postman is a warmed over western, and not even a very good western at that. I was not surprised that Kevin Costner wanted to film that book–its politically jingoistic nature and focus on the strong individual overcoming all was just the kind of role that he would have written for himself, and often does. The background to The Postman may imply science fiction for those who let anything about a possible future be defined as such, but I maintain that science fiction is fiction that contains a strong element of science to it. The Postman is a fantasy, albeit (thanks to David Beach for reminding me of this useful word) a depressing, end-of-the-world sort. Which brings me back to the book at hand, which is so consumed with science that it nearly overloads the reader. 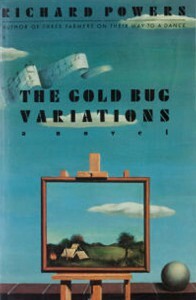 The Gold Bug Variations is not set in the future, though, and that’s why most people would question its SF credentials. Instead, it is set in the most recent past–the present of when it was published. A reader that comes to The Gold Bug Variations without a scientific background, or at least some basic knowledge of genetics, will soon find themselves drowning within the terms that infuse the book, but it works because the viewpoint character is a reference librarian who has fallen deeply for a geneticist. There are constant references to cracking the code of the central mystery, items occurring in genus and phyla. Even beyond my personal definition of science fiction, it even matches that broader definition of SF as fiction about worlds that are not. In the end of this book, an action occurs using ATM and other financial devices that did not occur (and I question whether it could ever have occurred) in our world. For the book at hand, it is believable, a strong evidence for a writer creating a self-consistent world-view. This is all beside the point that I really want to make, and that this is simply the best book I’ve read since I finished A.S. Byatt’s Possession, discussed long ago in Installment #7, I think. I still remember the thrill of ending Byatt’s novel, of the hair of my arms sticking up in a static reaction because of how everything in the book just came out “right.” How I kept reading slower and slower, trying to make Byatt’s world last just a moment longer, trying to delay arriving at that last word. Powers’ novel affected me differently, but just as powerfully. I picked it up one night around 8pm. I was around page 400, I recall, and started reading, and kept reading, and continued reading. I knew it was getting late, but I could not stop; I needed to finish this book. I was propped up in bed, Jill fast asleep beside me as I sped through the pages. I had to know what happened to these people. As the end got nearer and nearer, tears rolled down my cheeks. I had gotten to know these people so well in 600+ pages that I was entirely sympathetic to their agony and joy. That’s powerful stuff, folk. I can not recommend this book too highly. It shares a lot of my feelings about literature–that it can be intellectually rewarding and emotive at the same time, that it need not be an adventure to be engaging, that it be about individuals and about the world. I need to find out if Powers’ other novels achieve this same intensity, but I guess it will have to wait until I have the time to read the rest of Byatt’s oeuvre as well.